This morning we launched the start of work on our new design. There’s lots of details still to be sorted and lots of work we want to do that will improve the UX workflow but this is a first step, and we wanted to get it out there. This is a project that has always benefited from feedback and ideas from the community, and we are grateful for the advice we have already received – more is welcome! We also launched a new feature that several people have been talking about recently: Curated Lists. These are lists that a user can create then pick and choose events from the site to add. They can build up a personal list of events on the same topic, in the same area or events they endorse. You can then get a feed or a widget for your website that lets you display only entries from your curated list. At the moment all lists are public. If lots of people ask we may think about private lists later but so far no-one has come up with a good use for them. At the moment only the list owner can add events. In the future owners will be able to specify other user who can add events (UPDATE: now done), or specify that the list is open for all users to add events to. We will also look at letting you add groups to your list to. But that’s a lot of talk about features – wouldn’t it be great if there was an easier way to discuss all this? In fact, something else we are starting is an open issue tracker on GitHub – this will hopefully make it even easier for the community to suggest ideas and feedback on what they want to see. Get stuck in and post suggestions there! So again, all feeback is welcome by email or via our issue tracker or in person at an event – talk soon! Today we launch another tool to help event attendees stay organised – a personalised email on the morning of events they are interested in. Turn the email off completely. Choose to only be emailed when an event is on today you’ve said you would go to. Choose to only be emailed when an event is on today you’ve said you would or may go to (the default). 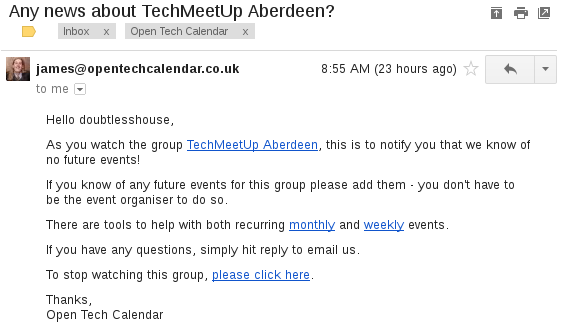 Choose to only be emailed when an event is on today you’ve said you would or may go to, or is on in a group you follow. Making our event data as useful as possible! As we build up a collection of great event data, we want to make sure it’s as useful as possible to all. So today we unveiled a help section about our API’s listing the ICAL, ATOM, JSON and JSONP end points on the site. There’s lots of other work going on, but a lot of it is behind the scenes. You’ll see a lot of cool stuff coming soon tho! Author jmbtechnologyltdPosted on November 30, 2012 November 30, 2012 Categories News, Tech DetailsLeave a comment on Making our event data as useful as possible! To make it as easy as possible for people to add events, we’ve added importers so data from any iCal feed like Google Calendar or sites like Meetup, Eventbrite and Lanyrd can be pulled in easily. We’ve actually been running this for over a month and importing all the events for WordPress Scotland; but we wanted to make sure it’s right. There were a number of bugs in the iCal parser library we used and in the end, we wrote our own from scratch. We also care deeply about the quality of the data. We don’t want an importer to run for ever, adding an event that has long since stopped. So every couple of months, we temporarily disable each importer and send an email to those who watch the group asking if it’s still valid. It’s easy to re-enable if it is. To use it, simply go to a group and click the new “importers” tab. You can add a new importer or see the existing ones. You can see the results of running the importer to. Any feedback welcome; talk soon! Thanks to Toshiba Medical Visualization Systems! Thanks to Toshiba Medical Visualization Systems for coming on board as our first sponsor! Many of the TMVS staff from their north Edinburgh office are regulars at meetups around Edinburgh, and it’s really great to see them support this community tool. TMVS develops diagnosis and treatment software for viewing and working with medical image data. Their work covers a wide variety of areas including application development (both desktop and web), graphics rendering technology, image analysis techniques and investigations into new techniques for diagnosis. You can find their work integrated into a wide number of products including Toshiba CT, MRI and Ultrasound scanners. In addition to the jobs advertised on their website, they also welcome applications for internships both for engineers and clinical specialists. We’ll use the investment to pick up some goodies like a SSL certificate for the site to ensure account holders details are protected, but mainly it’s great to secure the time investment the project needs to smooth off the rough edges and really get stuck in. There’s been some great interest in the site recently, and we look forwards to posting more news and attending some great events soon. Author jmbtechnologyltdPosted on November 7, 2012 Categories NewsLeave a comment on Thanks to Toshiba Medical Visualization Systems! Some previously mentioned features are now live such as weekly and monthly recurring events, and iCal import is in testing on the live site. But a whole set of other features that have never been mentioned on this blog are now live, and I wanted to guide you through them. 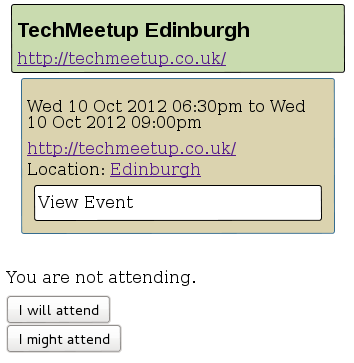 Any logged in user can now say they will attend or may attend an event. This will appear on their own custom calendar and a iCal feed is available. This is the ultimate in filtered feeds; now you can have a filtered feed of only the events you are interested in! I just want to say I’m going to be very careful about how the public features play out. I’ve used my own experience as a event organiser to think carefully about how a good calendar site should work and I don’t want to mess it up. If it turns out people want to use the personal private calendars but no-one wants to use the public calendars, that’s fine and I won’t complain. But all that’s a topic for a future blog post, or a rant down the pub tonight. Any events from the group will appear on your private calendar and private iCal feed. You’ll get an email any time someone else changes the group or an event in it. 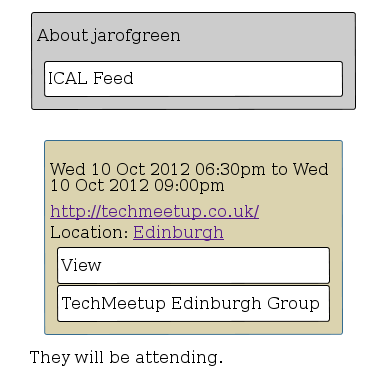 I’ll be at TechMeetup Edinburgh tonight (in case you haven’t picked that up from all the screenshots!) so any comments or feedback can be delivered in person, by email, by twitter or in the comments here. I’ve started doing lots of sketches to plan a new UI/UX that will simplify the workflow and functionality, as at the moment its generally all over the place. In terms of features, I’ll work on more importers and an optional reminder email about upcoming events on your personal calendar. We are also looking for sponsors – we don’t have a Sponsor pack yet but get in touch and tell me what you want to know. Our launch on Sunday July 22nd makes this Saturday our 2 month birthday! Our website has picked up 1,000 visits, 650 unique visits and 4,700 pageviews – and not a single one in IE6! Our geeky audience means our browser stats still follow a pattern most websites probably wouldn’t recognise – 50% Chrome, 22% Firefox, 10% Safari, 6% Android and 5% Internet Explorer. Our ATOM and ICAL feeds are being picked up by multiple readers and I think a screen in Amazon’s Edinburgh office shows the upcoming events as handy info for the workers. A wide variety of groups have added events from SQL Server to WordPress with OWASP security, Open Street Map and everything in between. New features include weekly recurring events, and monthly recurring events and an iCal importer are both in the final stages of development. A monthly HTML email has been put together and you can see a preview of that here. We recently moved to a server of our very own on Bytemark’s Bigv cloud, which should give us plenty of possibilities for growth. Thanks for all the interest and support we have received so far; it’s great to get such a positive reaction. I’ll have much more time to devote to this project in October, so expect more features and news soon. Author jmbtechnologyltdPosted on September 20, 2012 Categories NewsLeave a comment on 2 months old! Version 2 released less than a month after launch! Today we are proud to announce the launch of a custom built web app! We started with a wiki and while that got us of to a great start it was clear some things we wanted to do down the road would either be impossible or very fiddly for the users. So we decided to bite the bullet now and go for a rewrite in Symfony 2. 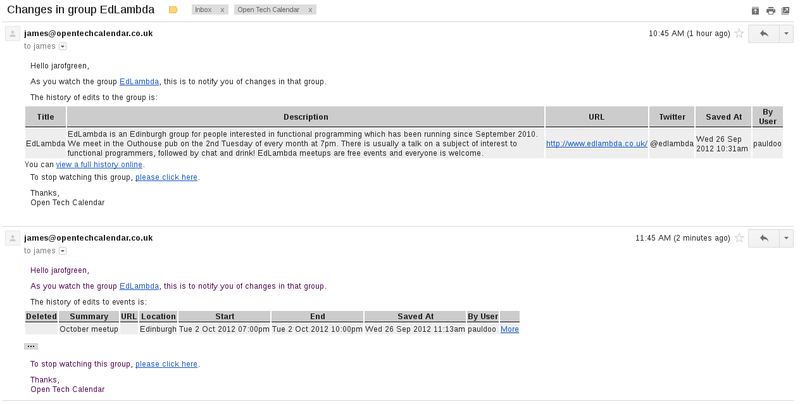 However we still embrace wiki principals of openness with any user being able to edit any event. Like a wiki, all edits and deletes are versioned and can easily be rolled back. This rewrite already brings some new features; you can now export an iCal feed of just one event or of the events from just one group. However it is still very rough, with the design and many user interfaces needing work. We will be working on those alongside new features – locations being the first big feature we will add. For now, any feedback is welcome. We are looking forwards to OggCamp this weekend – talk to you there? Author jmbtechnologyltdPosted on August 16, 2012 August 16, 2012 Categories NewsLeave a comment on Version 2 released less than a month after launch! It’s one week after our launch and we wanted to thank everyone for the positive feedback! We have received lots of feedback and feature requests from our early contributors, one of which has already been coded and released. 50% Chrome! 50%! A mere 4% IE! And not a single IE 6 visitor! Edinburgh is about to go festival crazy and things just generally go a bit odd at this time of year. We’ll quietly be here, working with event organisers to add more events and working to pass the word among the tech communities. I’ll be at OggCamp and TuringFestival, which will be a great opportunity to spread the word. Then as all the tech events pick up in September, we’ll see you there and we’ll see what happens next! Author jmbtechnologyltdPosted on July 30, 2012 August 16, 2012 Categories NewsLeave a comment on One Week Old!